You can attend FEDORA’s General Assembly with one voting right and thereby bring forward ideas and take part in decisions about the future of the FEDORA network. TICKET SERVICE : FEDORA’s newsletter will inform you about upcoming special performances at Opera Houses and Festivals abroad. You can reserve tickets at Opera Houses and Festivals via FE DORA and attend events abroad, as a result of this exclusive service provided by FEDORA. SPECIAL EVENTS: FEDORA will offer you access to special events hosted by different Opera Houses, Festivals, and Friends Associations in Europe. These offerings may include additional benefits such as opportunities to meet with artists, to attend festive dinners, cocktail receptions, etc. CULTURAL TRIPS: FEDORA will be organising cultural trips for you to discover European cities and experience unforgettable opera and ballet performance evenings at renowned Opera Houses and Festivals. The unique aspect about these cultural trips is the ability to meet other European philanthropists, who share the same interest and passion for opera and ballet. 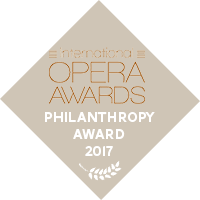 FEDORA PRIZES AWARD NIGHT: A FEDORA Gala will be organised once a year in collaboration with Europe’s major Opera Houses and Festivals to celebrate and support outstanding opera and ballet productions. On this occasion, FEDORA will announce the winners of the FEDORA Prizes, awarding talented young artists for their opera and ballet creations. You can make a ticket reservation by email or by telephone to FEDORA. You have the possibility to book up to 2 tickets at a time when using FEDORA’s services. You will receive priority seating at the FEDORA Prizes Award Night. its best to inquire about ticket availability. Your reservations will be given high priority. You have the possibility to receive communication material of Opera Houses and Festivals. You will be involved in the FEDORA Prizes’ projects. You will be recognized in FEDORA’s communications. FEDORA assists you to organise cultural trips for you and your guests and offers you customized group packages to attend performances at Opera Houses and Festivals abroad. You will receive higher seating priority at the FEDORA Prizes Award Night. You will have access to season presentations at Opera Houses and Festivals (if available). Your reservations will be given highest priority. You have the possibility to book up to 4 tickets at a time when using FEDORA’s services. You will be recognized on FEDORA’s website. You will receive highest seating priority at the FE DOR A Prizes Award Night. internationally renown experts of the opera and ballet world. You will have access to rehearsals of the project winners of the FEDORA Prizes. You will be invited to the FEDORA President Circle Dinner.